Summer time brings about a lot of challenges for new parents. The heat, the longer daylight hours, the noise around the neighborhood – all kinds of things that can disrupt a baby’s normal sleep schedule. 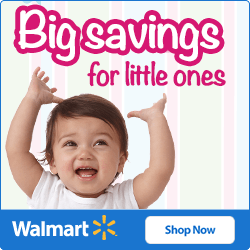 Plus, there are barbecues and birthday parties and all kinds of activities that will have you realizing just how much gear your little one requires for a single day. Here are some tips for keeping your baby cool, comfortable, and healthy during the hot summer months. 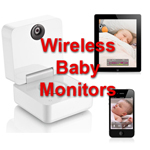 Light-proof your baby’s room. It should be totally dark in there, with the possible exception of a night light. Use room-darkening shades and heavy curtains if possible. Use soft music or white noise to block out noises. Lawnmowers, barking dogs, kids at play, and other sources of noise are big problems for getting and keeping your baby asleep. 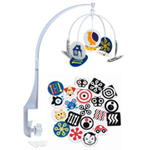 See our soother & sound machine guide for some good options. If you’re going to travel, bring a comfortable and safe place for baby to sleep. 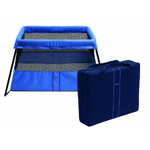 See our travel crib reviews for some of the latest portable cribs and bassinets, some of which even fit into a backpack! Stick to your early bedtime. It’s so, so easy to let your baby stay up later because hey, it’s light outside! Tempting as that is, you have to stay consistent to reap the benefits of an early bedtime. Maintaining your baby’s good sleep habits in summer time means more rest for the both of you, and that translates to a healthier, happier summer all around. 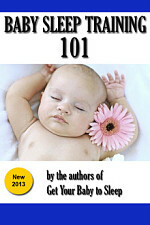 See our article on 3 Keys to Summer Sleep. Get the car cool in advance. The inside of a car in the summer sun might be over 100 degrees. And putting a baby into a hot black car seat will make him or her wail, I promise you. So make sure that 5-10 minutes before taking your little one out, you roll down the windows and open doors to let out the hot air, and then turn on the A/C. Block out the sun. One problem we’ve often encountered in summer months is sunlight shining right in a baby’s face. This seems to happen most often with rear-facing car seats (in case you hadn’t heard, they now recommend rear-facing until 2 years of age). Babies have sensitive eyes and they don’t like this one bit! Invest in at least one car window shade for each side and set them up before you leave. You’ll be glad for it. Bring plenty of snacks for long car rides. Once your baby is old enough to feed himself “finger foods”, these become an essential item for long (or even short) car trips. The soft cereal-like puffs made by baby food manufacturers are ideal for this, as are Cheerios, yogurt bites, and other small, easy-to-chew foods. Pack lots of toys and entertainment. The unfortunate part of rear-facing car seats is that the view never changes for your baby. 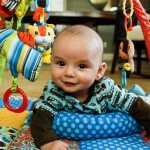 So you’ll want to pack lots of toys, baby books, stuffed animals, and other sources of entertainment for the car ride. A literal bucket of toys is probably just enough, because they’ll mostly be discarded out of reach onto the floor of the car. 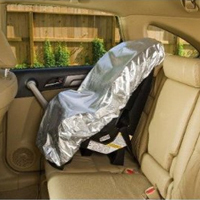 A car seat sunshade can be stretched over your baby’s car seat (while it’s empty) to reflect out heat and keep the seat cool. Having car window shades to block out the sunlight is essential, especially for rear-facing car seats in the morning or afternoon. And they’re much classier than the old receiving-blanket-over-the-dry-cleaning-hook. 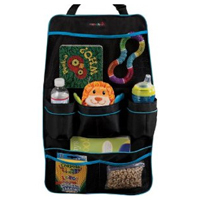 A backseat organizer is a great way to prep for your road trip – load it with toys, snacks, pacifiers, wipes, and everything you might need. 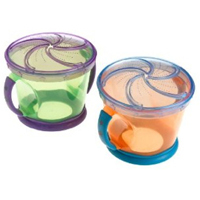 These car snack catchers are ideal for airtight storage of finger foods – cheerios, puffs, raisins, or other snacks – that you can offer your toddler in case of a meltdown. And of course, you can expect that most of those finger foods will end up in places other than your little one’s mouth. 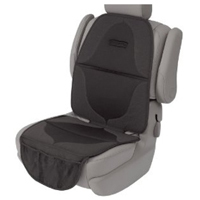 Here’s a great idea: a dual-layer car seat mat that protects your car from the mess that babies bring with them. If you plan to bring breastmilk or other liquids for your baby, keeping it cool in the summertime can be harder. 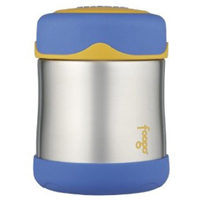 Thermos makes a leakproof food jar that’s stainless steel and well-insulated for this task. Keeping your baby comfortable and entertained in the car makes the difference between a pleasant road trip and a nightmare. Summer brings new hazards for when you bring your baby outside. Wasn’t it wonderful in springtime, when the weather wasn’t too hot, the bugs hadn’t come out, and things wouldn’t melt in the car? Summer is a great time to let your baby play outdoors, but here are some tips to keep everyone safe. Bring plenty of sun protection. 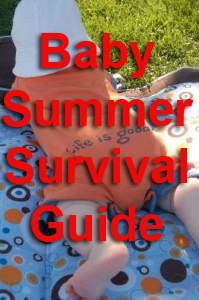 Your goal should generally be to keep baby out of the sun, in addition to a good baby sunscreen. Canopies, shades, bonnets, hats, and clothing are the best UV protection. Invest in multiple strollers. Some days an umbrella stroller tossed in the trunk will do. For rougher terrain, though, you’ll probably want something sturdier. See our Pram & Stroller Reviews for some great suggestions. 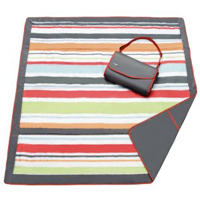 Pack a quilt or blanket for a soft play area. It’s tempting to let your babies play in the grass, but you might recall from your own childhood that doing so tends to make your skin itch afterward. Plus, there are bugs and sticks and other things that your baby might bump against or try to eat. Protect from bugs! Especially mosquitoes, which will likely be especially bad this year in the U.S. due to a mild winter. 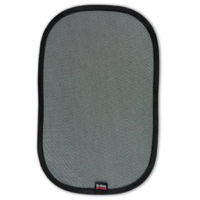 You can check with your pediatrician about bug spray, but I really like the non-chemical solution of protective mesh netting that you can put around the stroller, car seat, or baby carrier. Get a baby carrier. Baby Bjorn, Chicco, and other companies make nice front-loading or backpack carriers that are ideal for toting your little one around. See our baby carrier reviews for some recommendations. 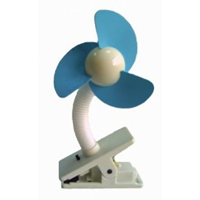 A stroller fan can be clipped to the stroller and offer a little cool air, especially if you’re stuck somewhere outside and it’s hot and stuffy. Always keep a fold-up picnic blanket in the car that you can grab in case so that everyone has somewhere soft and clean to sit. 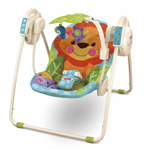 It’s also great for letting your little one get some tummy time or play on the sans grass stains. 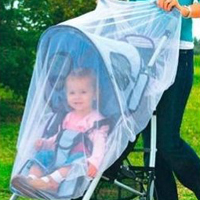 I really like bug-proof stroller netting for the stroller, car seat, or baby bouncer. It keeps the bugs away, blocks a little bit of sun, and has the added bonus of protecting against over-touchy strangers. Protect your baby’s perfect skin from sunburns and bug bites! Someday they’ll thank you for it. Now, get out there and enjoy the summer! Your baby will only be this little once.